U.S. Unemployment Holds At 3.7 Percent As Economy Adds 155,000 Jobs The jobless rate remained the lowest in nearly 50 years last month as employers added fewer jobs than expected. Meanwhile, wages grew 3.1 percent over the past 12 months, the same as in October. 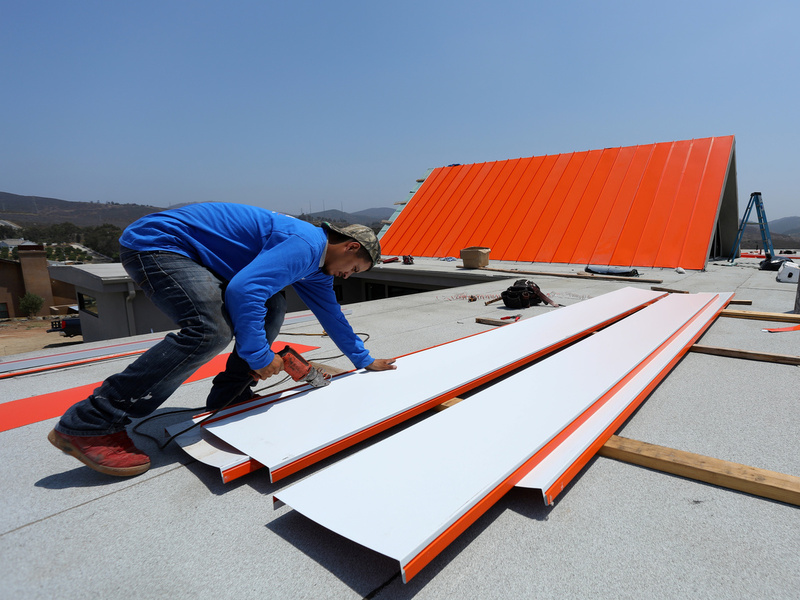 A worker installs a roof on a home being built in San Diego in 2017. The housing market has been softening, with sales of new single-family homes falling in October to the lowest level in more than 2 1/2 years. The jobless rate remained at a nearly 50-year low of 3.7 percent in November as employers added 155,000 jobs, fewer than in October and less than expected by private analysts. Meanwhile, wages grew 3.1 percent over the past 12 months, the same rate as in October, the Bureau of Labor Statistics said. Average earnings climbed to $27.35 an hour. "That's not a lottery jackpot, but it also doesn't set off inflation alarm bells for financial markets or central bankers," Mark Hamrick, Bankrate.com senior economic analyst, said of the wage growth number. In October, employers added a revised 237,000 workers — down from the 250,000 originally reported. September's job growth was revised up slightly to a gain of 119,000. Private analysts had forecast that the unemployment rate remained at 3.7 percent and that the economy added 190,000 jobs. The jobless rate has been below 4 percent since July. Employment sectors adding jobs in November included: health care, which grew by more than 40,000; professional and business services, 32,000; manufacturing, 27,000; transportation and warehousing, more than 25,000; and retail, more than 18,000. Friday's report shows that the U.S. labor market remains healthy, but the monthly release comes at a precarious time for the economy. Stock markets have seen wild swings this week over U.S.-China trade tensions, and there are some signs in the bond market that may be signaling a recession. The Dow Jones Industrial Average fell 558 points, losing 2.2 percent, on Friday. On Thursday, the blue chip index slid more than 750 points before recovering to close down 79 points. On Tuesday, the Dow plunged 799 points. The report is the last look at key labor market data that Federal Reserve policymakers will have before they meet Dec. 18-19. At that meeting, the Fed is widely expected to raise interest rates by a quarter percentage point. It would be the fourth such increase in 2018 and the ninth hike in the past three years. Curt Long, chief economist for the National Association of Federally-Insured Credit Unions, called the jobs report "sturdy but uninspiring." With job growth lagging the 2018 average by 50,000 jobs and unemployment and wage growth holding steady, the data is likely to keep the Fed on track to raise rates this month, he said. But it will also mean fewer rate increases are likely in 2019, Long said. The housing market has also been softening, another development that could weaken the overall economy. Sales of new single-family homes fell 8.9 percent in October to a seasonally adjusted annual rate of 544,000 — the lowest level in more than 2 1/2 years. In November, only 5,000 construction jobs were added — down from the 24,000 added a month earlier.